As market forces drive electronic and mechanical devices to become smaller and smaller, there is a rapidly intensifying need for high-density and energy-efficient magnetic information storage. However, magnetic storage becomes increasingly volatile and less efficient as it decreases in size, creating significant barriers for high-performance computation and information processing. Now, a team of Ohio State researchers has received a $6.34 million award from the Defense Advanced Research Projects Agency (DARPA) to develop novel magnetic materials by unlocking the power of skyrmions, nanoscale spin textures that offer promise for storage miniaturization. The team is based at the Center for Emergent Materials (CEM), a National Science Foundation (NSF)-funded Materials Research Science and Engineering Center. The three-and-a-half-year award period runs from Feb. 1, 2018, through July 31, 2021. The Ohio State collaborators are one of a handful of successful teams to win this award in an international competition as part of DARPA’s Topological Excitations in Electronics (TEE) program. TEE endeavors to design materials with new, controllable functionalities in memory, logic, sensors and quantum information processing — all having critical implications for the nation’s economic, energy and defense security. In magnetic memories, information (for example, a collection of bits) is stored as clusters of spins, which are either an up or a down (or put differently, a one or a zero). These spin clusters, which form the basis of magnetic memories, become less stable when reduced in size. Randeria says that skyrmions, topologically stable spin textures, could be the key for creating smaller magnetic information storage that is still stable and efficient. He says a skyrmion is like a nanoscale “whirlpool” of spins in the magnetization texture. Skyrmions behave like particles that can be created, moved and manipulated, and they are stable at room temperature. As a result, they offer great promise for magnetic information storage in miniaturized applications. 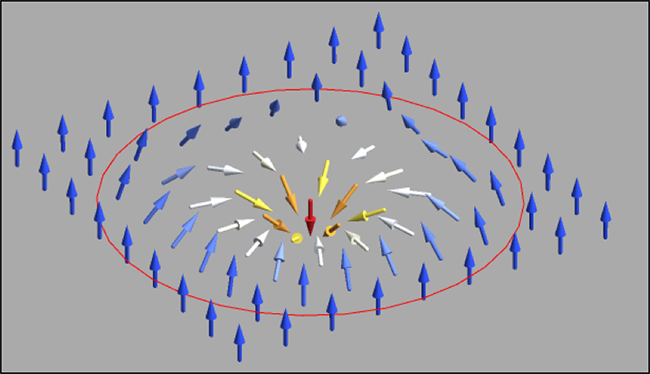 An example of magnetic spin texture in a single skyrmion. Mohit Randeria, professor of physics and principal investigator on the DARPA award, describes a skyrmion as a nanoscale "whirlpool" of spins in the magnetization texture. Image courtesy of the researchers. In addition, skyrmion-based memories are likely to be more energy efficient than conventional magnetic memories, meaning that a smaller current is needed to read, write or manipulate the information. Joining Randeria on the project are CEM colleagues and co-principal investigators Jay Gupta, associate professor of physics; P. Chris Hammel, professor of physics, Ohio Eminent Scholar and director of CEM; Roland Kawakami, professor of physics; David McComb, professor of materials science engineering and Ohio Research Scholar; and Fengyuan Yang, professor of physics. Graduate students and postdocs collaborating on the project include Adam Ahmed, Bryan Esser and James Rowland. The team will explore new material platforms that can harbor skyrmions, and once a novel magnetic material is developed, they will probe the skyrmions and image the material to ensure they exist. From there, they will start manipulating the material to create a prototype memory-storage device. This new multimillion-dollar DARPA award builds on the demonstrated expertise and accomplishments of the team members and their ongoing collaborations, which previously have been catalyzed by seed funding from NSF through CEM, as well as from Ohio State’s Center for Exploration of Novel Complex Materials and the Institute for Materials Research. Thumbnail image: A crystalline array of skyrmion taken by transmission electron microscope at the Center for Electron Microscopy and Analysis (CEMAS).